"I'm a parent and grandparent. I want to make sure my children, my grandchildren have the access to the health care they want," the Republican governor, who's up for re-election this year, told reporters Thursday. "If it passes I'm going to sign it." The type of marijuana, which is low in THC (the psychoactive ingredient in marijuana), is aimed to help those suffering from epilepsy, as well as some cancer patients and those with persistent muscle spasms or seizures and who don't respond well to other medications, according to the Miami Herald. Qualified children will also have access to the strain. 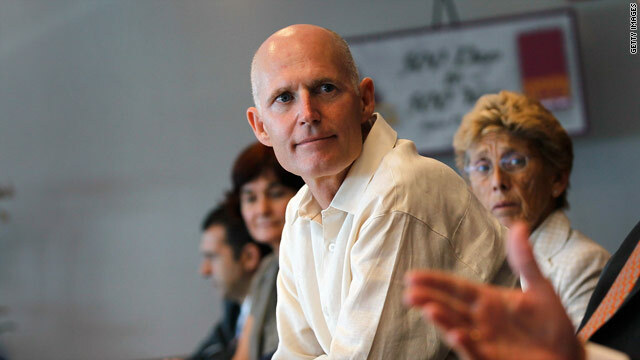 Scott's support for the bill came as a surprise for many in Florida, as the governor said in January he would not support a ballot initiative this November that would legalize medical marijuana through a constitutional amendment. "I have a great deal of empathy for people battling difficult diseases and I understand arguments in favor of this initiative," he said in a statement provided to CNN by a spokesman. "But, having seen the terrible affects (sic) of alcohol and drug abuse first-hand, I cannot endorse sending Florida down this path and I would personally vote against it." Recent polls in the state show strong, bipartisan support for the amendment. According to a Quinnipiac University poll released in November, 82% of Florida voters support legalizing medical marijuana, while 16% oppose it. Breaking it down by party lines, 87% of Democrats support it, as did 70% of Republicans. The use of marijuana for medical reasons is legal in 21 states and the District of Columbia, according to the National Conference of State Legislatures. Former Gov. Charlie Crist, who's challenging Scott this year in the gubernatorial election as a Democrat, has said he supports the ballot initiative. Rick Scott is trying everything to try and get votes. He's trailing so bad in the polls right now, he may even endorse Obamacare. Ha! --nothing wrong with it when Tobacco, alcohol are legalized, this way drug cartels lose the battle. Period. Yet another reason Scott is a good governor. He listens to the people and does the right thing (despite his personal views). Obama, take note. This guy only knows how to bow down and kneel in front of the Kock Brothers. Wow, Medicaid Thief the Orphan Maker is REALLY desperate! He's 10 points behind his opponent and is EXTREMELY unpopular! He visited a Senior Center in Boca Raton on Wednesday to discuss how "horrible" the ACA is, and was promptly put in his place by the seniors who told him he was barking up the wrong tree. Not surprisingly, he got snippy with them and spouted a few more derogatory anti-"Obamacare" lying points before storming off in a huff! Yeah, except no. He says whatever he thinks will get him votes, then does whatever he wants, Floridians be damned. Forgot to mention: There isn't a single resident in Boca Raton who qualifies as one of those "47 percenters" trashed by the 2012 also-ran. I find this an interesting stance from a man who's wife and her company made money off of drug testing welfare recipients on behalf of the state. "I find this an interesting stance from a man who's wife and her company made money off of drug testing welfare recipients on behalf of the state." It was his company really. They put it in her name when he ran for office. That's Charlie Christ you're thinking of...try to keep it straight.